The Skinny: A hilarious comedy that delivers irrelevant humor at a breakneck pace, Maiko Haaaan!!! has its flaws as a dramatic film. 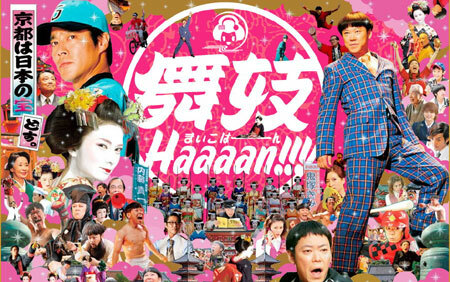 However, it's still one of the best Japanese comedies of 2007. You don't have to be obsessed with geishas to have a good time with Maiko Haaaan!! !, the insane comedy written by hot screenwriter Kankuro Kudo, responsible for the critically-acclaimed Go and the cult favorite Yaji and Kita: The Midnight Pilgrims. Here, Kudo takes a more mainstream route, telling a story about fetishes, male competitiveness, and cup noodles with crowd-pleasing results (and the box office gross to prove it). Even though Maiko Haaan!!! is high-energy, manic, and doesn't make a whole lot of sense, it's an efficient comedy that delivers on its promised goods. With a subject as traditionally Japanese as geishas (the "maiko" in the title refers to an apprentice geisha), it's surprising how well Maiko Haaaan!!! works for non-Japanese audiences. Working from Kudo's busy screenplay, Nibou Mizuta - who's worked on everything from television dramas to variety shows - uses all of his past experiences as a director, frantically throwing out one hilarious physical gag after another at a breakneck pace. At two full hours, the film almost becomes exhausting by the third act, when the screenplay's energy is diverted to give the film dramatic and emotional footing. However, Maiko Haaaan!!! is stuck with a not-very-likable protagonist in Onizuka (Sadao Abe), a salaryman at a cup noodle company who spends company time managing his website devoted to all things geisha. His dreams come true when he's transferred to Kyoto, where traditional Japan remains alive and well - especially geisha houses. Faced with the opportunity of "all maikos, all the time", Onizuka promptly dumps his homely girlfriend Fujiko (Kou Shibasaki) and heads to Kyoto. But when Onizuka pays his first visit to the geisha house, he finds out that he can't be allowed in without someone to vouch for him. Fortunately, his new boss volunteers to be his voucher if he can pick up sales, hence beginning his ambitious quest to create the new hit cup noodle. However, even when Onizuka finally enters the geisha house, he immediately finds a rival in Naito (Shinichi Tsutsumi), a baseball star who has challenged Onizuka's knowledge of maikos ever since his website days. Thus begins a battle between the two men to be the best in just about everything. The central conflict is easily the most fun aspect of the film, but the problem is that there is no one to root for in the battle. Abe's performance as Onizuka is appropriately over-the-top and funny, but his character is ultimately not a very likable person, with an obsession that is borderline creepy. Meanwhile, Tsutsumi makes a formidable antagonist as Naito with an equally amusing performance, but his arrogant persona makes him a comic villain with a sympathetic side. That leaves Shibasaki's Fujiko, who goes off to Kyoto to learn to become a maiko after being dumped. However, her involvement in the grand scheme serves only as an excuse for Kuro and co. to show how the maiko world works and has little bearing on the plot until the finale. Nevertheless, Kudo has a talent for upping the comic stakes in the battle between the two men, with each resorting to actions that continuously stretch credibility to the breaking point. These actions are done in a comic and over-the-top manner, recalling the days of the mo lei tau comedy of Hong Kong, which utilizes irrelevant and exaggerated humor that work charmingly. However, the screenplay is so focused on delivering the laughs that the ending comes far too quickly. The third act finally sets up the dramatic aspect of the story with a crucial twist, but Kudo seems to realize that he's run out of pages and simply brings the story to a convenient ending. While that means that Maiko Haaan!!! avoids the Japanese comedy curse of overstaying its welcome (though the melodrama remains intact here), the ending comes too abrupt to satisfy. As a result, the film delivers the comedy in spades, but doesn't quite succeed as a complete whole.